We'd prefer you just to buy the 20 max lottery tickets each yourselves and give the other only a hearty congratulations if they win. The Neopian Lottery is a single-person game. It will revert to the default avatar. If it's something minor like a couple misspellings and tiny grammar mistakes we'd go with the superior article. If it is plagued with many misspellings and poor grammar and formatting then we'd probably pass on it unless it just blows us away with awesomeness aside from those flaws. We'd think the Customisation Spotlight works well with how it is currently set up. Too many winners would take away some of the prestige that comes with winning the Custom Spot. The reason certain species seem under-represented is because basically they are, population-wise. 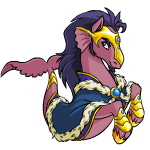 Neopets that have fewer numbers but are coveted by a lot of players (like the Draik) make up for their lack of numbers with their "ooohhh... ahhhh" factor. If you want to see a Buzz and Jetsam get voted to the top, then grab a morphing potion, paint brush, and use your fashion skills to make a spotlight entry that will just blow everyone away. Good luck! Hmm? What's all the BUZZ about here? Happy New Year! :D Hmm... you know, it really depends on Sophie's mood and your sense of humour to say whether she's a hero or villain. For example, if you think getting turned into a Meowclops or Mortog by an irate witch is funny, then Sophie is probably a hero to you. If not, well... maybe whoever made her card wasn't so thrilled with it. We're assuming you mean animated gifs? o.O Yeah, these are just fine as long as the content is appropriate. It's really rare that a single person asks two questions that we want to put into the Editorial, but we think it's happened before. The question is really the important part. Oh dear. We think your Neopets wouldn't be too happy having to clean up after... *pulls off socks* fourteen... fifteen... SIXTEEN Petpets running around the Neohome. That's just a little too much. We think it's good there's a limit of one per Neopet. Perhaps the nails wasn't secured enoug-- err, we mean, what kind of lies and slander are you trying to spread about Coconut Shy? We're sure all the carnival attendants at the Deserted Fairground are appalled by such allegations! Our resident User Lookup of the Week judge kindly requests that you leave room for another trophy in your design when you submit a UL to the competition. We do hate it to spotlight a UL then accidentally flaw the design of it when we grant the trophy. Just an FYI!